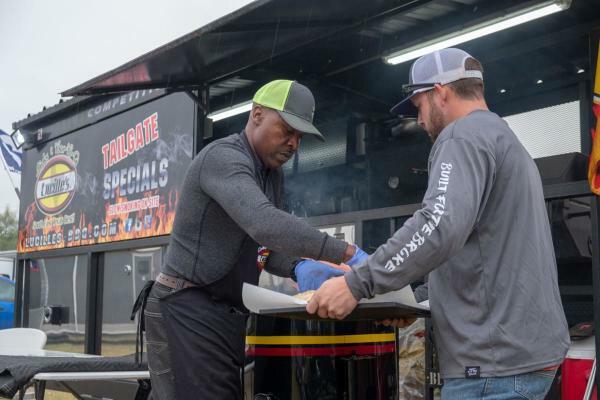 NOLANVILLE — ​​This year marked the fifth annual Que 4 Kids fundraising event, a three-day event held to benefit Aware Central Texas and held at Sandy’s Lone Star Event Center. Executive Director Misty Biddick said that Que 4 Kids is the largest fundraiser of the year for the organization. “It allows us to go out into the community and keep our mission,“ she said. Event planner Jarrod Young’s mother, Teresa Young, was very involved with Aware Central Texas, so after her passing, Jarrod Young began Que 4 Kids. “It’s an honor and a privilege to carry on the legacy of such a special woman,” he said. Young said that the original idea began on the back of a napkin. With the help of his cousin, Cleat Roberts, who owns Sandy’s, and several volunteers, the idea became a reality. The idea may have begun on a simple napkin, but that first year still raised $13,000. Last year raised $100,000 (before expenses), and though this year’s tally isn’t in yet, Friday night’s live musical performance by Neal McCoy alone had an estimated 800 people in attendance. Saturday’s barbecue cook-off may have seen rain, but there was still a good turnout, with over 40 adult teams and over a dozen children entered in the contest. In addition to the cook-offs, there were raffles, a bounce house and a climbing wall, among other activities.